A playlist of environmental education videos. Earth Day has deep roots in education. The first one was in 1970, held as a "national teach-in on the environment." It was groundbreaking in that it brought together people with different beliefs and backgrounds to fight for a single cause. We celebrate on April 22nd, but you can teach your students about sustainability and environmental stewardship all year round. It doesn't take much for kids to feel like they can make a difference for our planet, mobilizing them to be life-long environmentalists! Here's a playlist of videos to get started. Watch the player below to see the whole playlist, or view it on YouTube. This great video shows how every subject ties in to environmental ed, and asks educators and parents to get the kids outside! 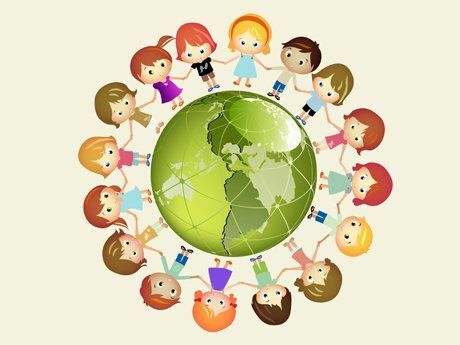 Learn about about the history of Earth Day and the Earth Day Network's work in education. This moving video follows a group of kids from Brooklyn as they re-connect with nature through the LEAF program. Love this spunky Australian video where a team of exuberant kids explain how to change the world in just five minutes every day. A few basic Earth Day activities to get your creative juices flowing. Perfect if you only have a few moments to brainstorm. Short but powerful message from GOOD Magazine about how plastic impacts the environment. Remember your re-usable grocery bags! Did you know there's an "Earth Hour" in addition to Earth Day? In late March every year, people around the world turn off the power. Service learning in action in a middle school classroom in Louisiana -- sixth graders learn to restore the wetlands near their school. This fun viral ad became a user-generated meme as people made their own "Boom De Ah Dah" videos about what they loved about the earth. Celebrated conservationist Jane Goodall enables young people to save the planet with her organization's message of hope. YouTube is chock full of Earth Day / Friday parodies. This one is to promote a school's Earth Day Film Festival of student-produced videos. Sorry! So here's the question: how do you get from crafty commemorative activities for Earth Day to meaningful projects that have lasting value? 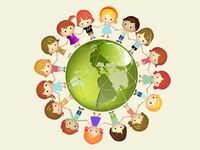 Start by reading former Edutopia blogger Gaetan Pappalardo's blog post, Elementary Art and Service Learning Projects for Earth Day and Beyond, where he tackles that very topic. Visit the Earth Day Network's Green Schools Leadership Center to find lesson plans, grant information, and an online community. You can also get teaching resources at the National Environmental Education Foundation and the Go Green Initiative. Join Jane Goodall's Roots and Shoots service learning organization, or get involved with the Nature Conservancy's Leaders in Environmental Action for the Future (LEAF) program. Start in your own room by reading How to Go Green: Teachers from Discovery's Treehugger website, or pursue whole-school change with the National Wildlife Federation's Eco-Schools movement. From small personal actions to large-scale reform, it's always a great time to teach the next generation about taking care of the planet. Editor's Note: Originally published April 20th, 2012.